progeCAD 2017 takes another step forward presenting the new version based on the entirely rewritten source code with the new up-to-date Ribbon look, improved performance, native 64-bit and multi-core support. ProgeSOFT SA, the leader in low-cost CAD solutions, is excited to announce the next major release of its flagship product, progeCAD 2017 Professional, a 2D/3D DWG/DXF-native general-purpose CAD application, an economic alternative to the AutoCAD® and AutoCAD LT® software. progeCAD will now support Autodesk-similar workspaces, a revamped AUTOCOMPLETE function, activation dialogues, dynamic block handling and overlay support. Significantly improved also existing commands such as LOFT, PURGE and QSELECT as well as DWF printing and DWF/DWFx to DWG conversion. 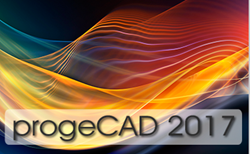 progeCAD 2017 will offer a series of new commands and AutoCAD-2016-compatible variables as well as some other valuable new features too numerous to list here. Click http://lnk.progesoft.com/oxLTqre4 to watch Video illustrating the new features of progeCAD 2017 Professional. Furthermore, progeCAD 2017 enhances interoperability between progeCAD Professional and Microstation® by improving support reading Microstation® DGN files, and enables interoperability between progeCAD Professional and AutoCAD® applications by introducing support for Civil3D, ADT and MDT file formats. Thanks to DGN support and improved Open .dgn, data exchange with Microstation® will become easier in progeCAD 2017 through conversion of .dgn files into .dwg drawings. Finally, AutoCAD® applications compatibility and porting are made much easier thanks to API .NET with user drawing interaction support. For more information refer to the http://www.progesoft.com/en/products/progecad-professional official website and the https://www.youtube.com/user/progesoft YouTube Channel. ProgeSOFT SA is a private software company specializing in cost-efficient CAD solutions. The company has been operating in the sector for more than 25 years offering the versatile CAD platform for Windows and Mac and applications for architectural, mechanical, electrical, GIS, HVAC/Piping and some other industries. ProgeSOFT is also a founder and executive member of the IntelliCAD® Technology Consortium.